Recent studies reveal that Phosphorus (P) in the form of phosphate, a macronutrient essential for plant growth, and crop yields can influence the bioavailability, retention, and mobility of trace elements, metal(loid)s, and radio nuclides in soils. When this occurs, phosphates can affect the dynamics of heavy metals and influence soil characteristics, impacting soil mobility and toxicity. Phosphate in Soils: Interaction with Micronutrients, Radionuclides and Heavy Metals utilizes the latest research to emphasize the role that phosphate plays in enhancing or reducing the mobility of heavy metals in soil, and the soil-water-plant environment. It provides an in-depth understanding of each heavy metal species, and expands on phosphate interactions in geological material. The author includes analytical and numerical solutions along with hands-on applications, and addresses other topics that include the transport and sorption modeling of heavy metals in the presence of phosphate at different scales in the vadose zone. H. Magdi Selim is a professor of soil physics, A. George and Mildred L. Caldwell Endowed Professor, School of Plant, Environmental and Soil Sciences at Louisiana State University at Baton Rouge. He received his BS in soil science from Alexandria University, Egypt, and his MS and PhD degrees in soil physics from Iowa State University, Ames. His research lies in the areas of kinetics of reactive chemicals in heterogeneous porous media and transport modeling of dissolved chemicals in water-saturated and -unsaturated soils. He has authored or coauthored numerous scientific publications in several journals, and edited and coauthored several books. "The book consists of logically arranged twelve chapters each with a very helpful outline provided at the beginning. The text is extensive, supported by lots of quantification of heavy metals, illustration in figures, tables and chemical equations conveniently numbered to follow section sub-headings. Readers can delve further in issues of interest with more than 100 publications listed in the reference section of each chapter. This book critically examines the current knowledge about the inter-relationships between phosphate fertilizers and heavy metals and future research perspectives." "… draws on established soil chemical theories and recent research to provide a detailed overview of the impact of P addition on trace elements, in particular heavy metal contaminants, in soils. … written by international experts in soil science … valuable to both graduate students and established researchers." "This book has 12 single or multi-authored chapters that cover a range of topics related to the interactions in soils of various micronutrients, heavy metals, and radionuclides with added natural or synthetic phosphates. ... The text is generally easy to read..."
"… a compendium of contemporary research on mechanisms of immobilization and the release of metals, metalloids, and metallic radionuclides. … The book reached its stated goal in bringing together information on reactions mechanisms of immobilization and mobility of a wide range of heavy metals and radionuclides in one place for comparison across elements. It is an informative tool for an audience at the post-graduate level, researchers in the geosciences, engineers, practicing consultants, resource managers, and planners on the development of mitigation strategies and practices to enhance the remediation of contaminated field sites for years to come." "Despite decades of research, there is still much to be learned about the reactions and reaction products that occur from the addition of phosphorus to soils. The ramifications are significant and include providing basic phosphorus needs to plants, interactions with other plant essential elements, and interactions with and possible immobilization of contaminants in soils. 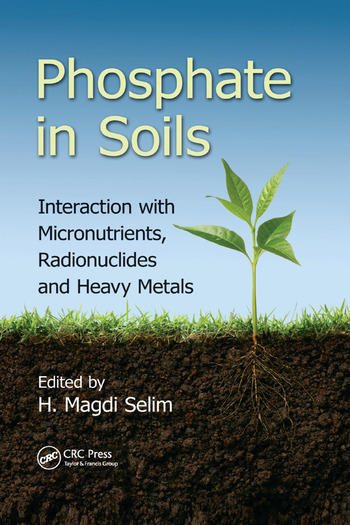 Phosphate in Soils: Interaction with Micronutrients, Radionuclides and Heavy Metals, edited by H. Magdi Selim, is an excellent summary of state-of-the-art science in this area, with the major emphasis on the interactions between phosphorus and contaminants. Twenty-nine eminent scholars from around the world author or co-author twelve chapters. Readers will benefit from a thorough coverage of the topic, including basic chemistry, mineralogy, and relevant case studies, as well as modeling approaches to various processes. This edited volume will surely become a highly cited source of information for many years."